I Landed in Plymouth – Team Monster Truck p/b Hub Bicycle Co. There is a bike on my shoulder. I am running up a hill. My lungs are gulping for air and I’m mentally shouting a mixture of encouragement and vulgarities at my legs as I demand they move faster. The air smells like pizza and dirt, it’s barely over 40 degrees F, and someone nearby is shouting at me “show me your pain face”. Only four minutes into my first lap and this is not a problem. 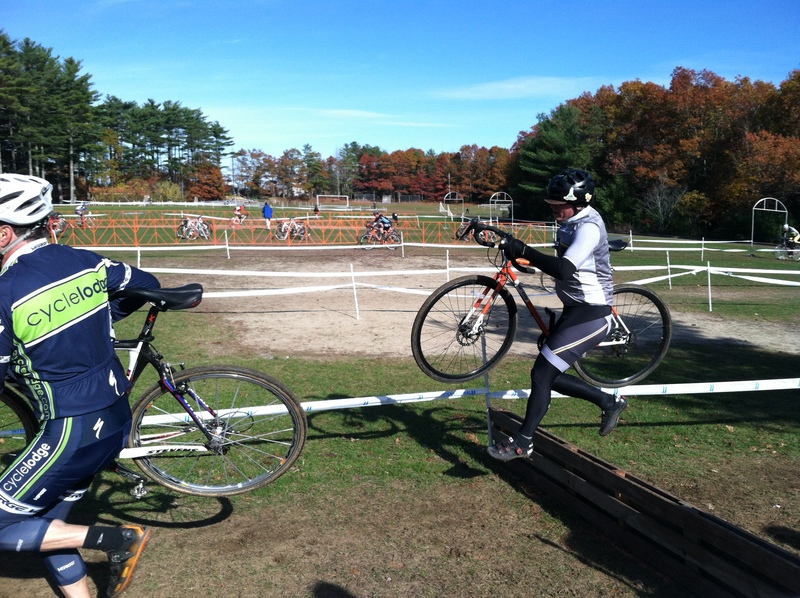 This is my first Masters race and I’m in Plymouth, MA. I’m Cat 5 and can tell everyone else around me has a lot more skill and speed than I do, but there’s less of them than there is during a typical Cat 4/5 race and I’m looking forward to hitting the course and making mistakes with less chance of crashing into someone else on the field. The course meanders over the school’s athletics field and the adjacent wooded areas. It’s a mixture of pavement, grass, 20′ of loose sand, dirt, dirt with gnarled roots, dirt with rocks, dirt covered with leaves, dirt that aspires to be mud, and of course stairs and barriers. The first quarter of the course attacks my aerobic levels immediately. The starting sprint leads into a root-bumpy descent in woods, it’s blanketed with sunlight that is striking through trees and fence material, cutting into shapes and bands that come in at odd angles to the earth, and I can’t be sure what the texture is of the dirt I’m about to ride over. It doesn’t matter, I grip the handlebars tight and aim as best as I can to avoid anything I do see in my way. The descent is over in two heartbeats, turns, and hits the ascent that you see me running up in the picture above. 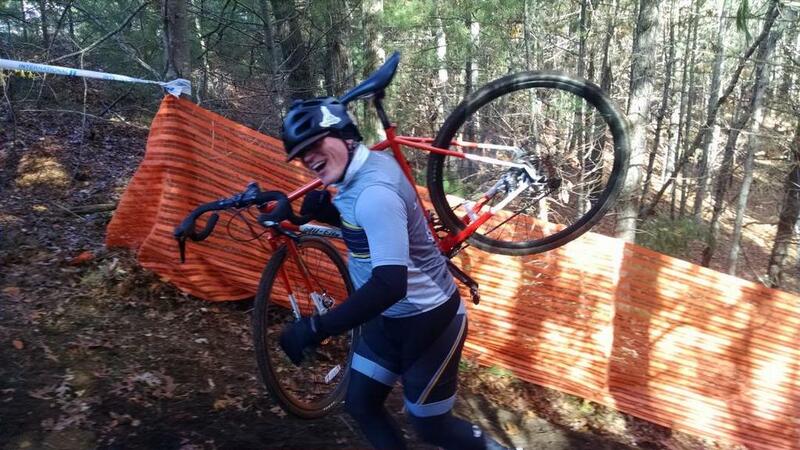 That climb is killer! It’s no wonder that the greatest heckling is heard here. After “surfacing” into the field I see three straight stretches that cross the field and switch back, with the barriers about half way through the third stretch. I’m just out of the woods (so to speak) and the next closest racer ahead of me is already hopping the barriers, there’s a good 30 seconds gap in between us. I’m going to try and catch up to him .. somehow. Loose sand is difficult. I do my best to follow the ruts that were being carved ahead of me, but I don’t have the umph to actually clear the full distance. That ends up being okay because I’m still trying to recover from the earlier run-up on the ascent, and dead ahead of me is another ascent. A shorter, happier one; but, there it is, dead ahead and me with no momentum to attempt a climb on the bike. Time for more running. I’m in the woods again. This is some technical stuff, lots of short dips and climbs with turns at both ends. There is this tree, it wants to be my friend a little too much, it sits on a turn during a climb where the best line of approach brings you straight up to it and turns to keep it within hugging distance. I do not want to get to know this tree better! I manage to avoid it each lap and congratulate myself every time I do. I’m through the thick of the trees and now am on a straight stretch composed of gravel and suffering. This is when I consider how much more I need to improve my aerobic levels. It’s a good lesson, I’ll take it, I’m better off now than I have been in 15 years and despite the challenge of this course I’m having a really good time testing all of my abilities. I have enough time to reflect on that while on the straight stretch because I’m not dodging immanent doom, I’ve passed that part. From here I take a quick couple of turns and I’m back on the field doing more tight turns around some sparsely placed trees. I cruise through a soft switch back and I’m lined up for the stairs. Off the bike, climb the stairs, turn right, remount, turn right, down the hill, back to the technical turns on the field. I pass by an inflatable bouncy castle and take some more turns before I’m looping around the end of the course to mark the conclusion of my first lap. I am exhausted, and energized, and my lungs already ache, and I’m pushing harder now because this is the sprint over the start/finish line and I need to get back to those tricky spots and see if I can do them better, faster this time. I know I will. Here we go lap two, you and me are going to have some fun!